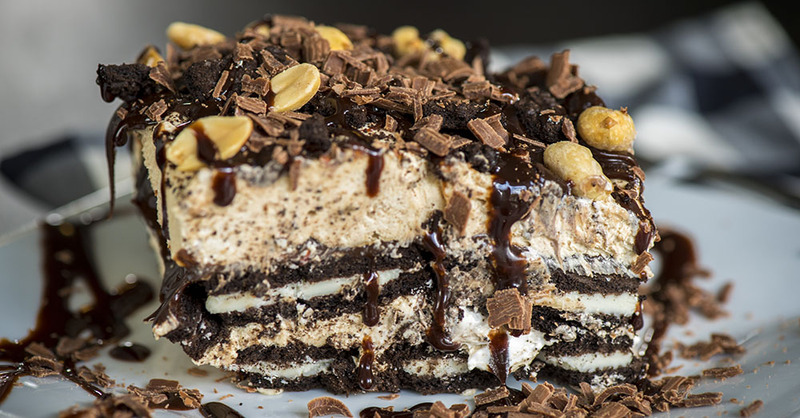 If you’re in the mood for a cool and creamy dessert that requires very little work, you’re going to love our latest icebox cake. Creamy peanut butter, fluffy Cool Whip, and crunchy Oreos give this dessert not only amazing flavor but texture too! This recipe is perfect for those days when we’re craving a sweet treat but don’t want to turn on the oven. It takes less than ten minutes to create the cake, then we pop it in the freezer for a few hours to set up – and did we mention it only has five ingredients?! Delicious desserts don’t get much easier than this. Our family gobbled this up, and we bet yours will too! Line an 8x8-inch baking dish with aluminum foil or parchment paper. Create four rows of Oreos along the bottom of your baking dish. Spread 1/2 peanut butter mixture over Oreo crust, then top with another layer of Oreos and 1/2 cup fudge. Spread on remaining peanut butter mixture and top with remaining fudge. Place in refrigerator for 4-8 hours, or overnight, or in freezer for 3-4 hours.